Experts believe that India’s rejection of the French Rafale fighter in favor of the Russian Su-30MKI is advantageous for India in every way. 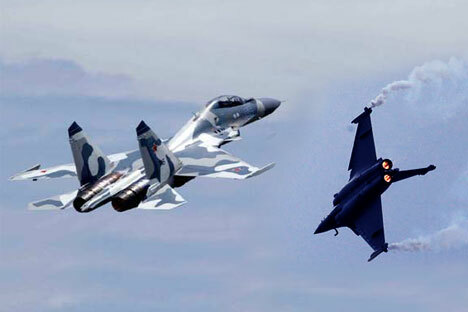 It is possible that India’s acquisition of the Su-30MKI fighter plane instead of the French Rafale is advantageous to the country’s air force in terms of cost, tactical and technical characteristics of the plane and a series of other reasons, says the official representative of the Center for Analysis of World Arms Trade (CAWAT). Previously The New Economic Times announced that the Ministry of Defense might refuse to purchase the French Rafale fighter and buy the Russian Su-30MKI instead. "India’s rejection of the French Rafale fighter in favor of the Russian Su-30MKI is advantageous for India in every way: according to its tactical and technical specifications the Russian plane is significantly superior to the French equivalent. Furthermore, for India’s air force the pricing is extremely important, and the increase of the initial price to almost double what was in the contract just doesn’t reflect the existing economic reality ", said a CAWAT representative. Is India aiming to boost the Rafale’s firepower with Russian missiles? He highlighted that India already had the conditions necessary for servicing the Su-30MKI and the purchase of the new batch of Russian fighters would only strengthen Russian-Indian military and technical cooperation: "The logistical supply chain for maintaining the Su-30MKI has already been established for the aircraft previously supplied by Russia and assembled in India. Furthermore, this aircraft is a 4++ generation fighter — it will ensure that the Indian air force is ready to accept the fifth generation fighters (FGFA)". According to the CAWAT representative, another reason for India’s rejection of the Rafale might be the French freeze on the delivery of the Mistral helicopter carrier to Russia. "The delay and possible refusal of France to deliver the Mistral to Russia creates the doubt that this country is a reliable partner for military and technical cooperation. It cannot be excluded that Paris for one political reason or another will not halt the execution of the contract on the Rafale delivery. Therefore the possible change of focus by India to the Su-30MKI will be a better choice for the country’s air force,” he highlighted.